The Universal Sling is the most commonly supplied sling for general transfer purposes. Easy to use and fit, the Universal sling is a multi-purpose sling that provides toileting access as well as good back and thigh support. 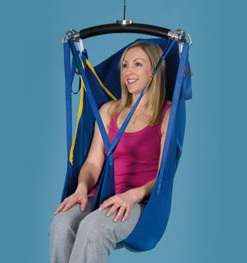 The sling comes with leg, hip, and shoulder straps, and features multiple color-coded loops to accommodate various seating positions. Universal Padded Slings are more comfortable and easier to fit. Provides optimum comfort and security. Leg loops are crossed between individual's thighs before passing leg straps through them. Individual's legs are together before passing leg straps under them. Leg loops are crossed under individual's thighs.